I had a small frame saw from sometime back (from Gramercy Tools), that I had rushed through a build on (trying to shape it with power sanders) that was never really pretty. It did however work 100% so for several years now I’ve used it. The fact these break down with the removal of the suspension string and blade make them easy to pack in the tool box, so it’s a lot easier than porting the frame saw I finished a few weeks back. And these are for cutting curves, that was for re-sawing wide boards, so – not really a comparison hey? This entry was posted in Shop stuff, Tools and tagged hand tools, made by hand, shop stuff on September 23, 2015 by bkbiggs. So a couple years back Shannon Rogers covered the creation of the Roubo style resaw frame saw in semester 4. And I purchased the metal and blades at that time and they’ve been moved around quite a bit since then. I recently got a spot between some projects, and decided to go ahead and do the Roubo style 4′ long, 4″ wide large saw to see how I can make do. I have lots of 8/4 cherry stock and my oldest daughter has asked for some wall units that would benefit from some book matched components. I figured since most of the stalk “could” be done on a bandsaw I’m covered if this doesn’t work out, but in the mean time it’s sure fun to try out these techniques. I’m pretty impressed to find out some manual operations are a lot faster than power tool operations – setup for hand tools is pretty easy sometimes, and sometimes a simple operation setup on the power tool is not. This entry was posted in Shop stuff, Shows, Tools and tagged hand tools, made by hand, shop stuff, Tools on September 4, 2015 by bkbiggs. The chisel that I rely heavily on when working up joinery is my paring chisel. It’s a 1 1/4″ Stanley SW chisel with the handle that fits into the shaft of the metal. That allows me to use the chisel handle that came with it… or the longer chisel handle that I turned a couple years back. The longer handle allows me more body control when I want it, and I favor that handle because I’m more comfortable with it. 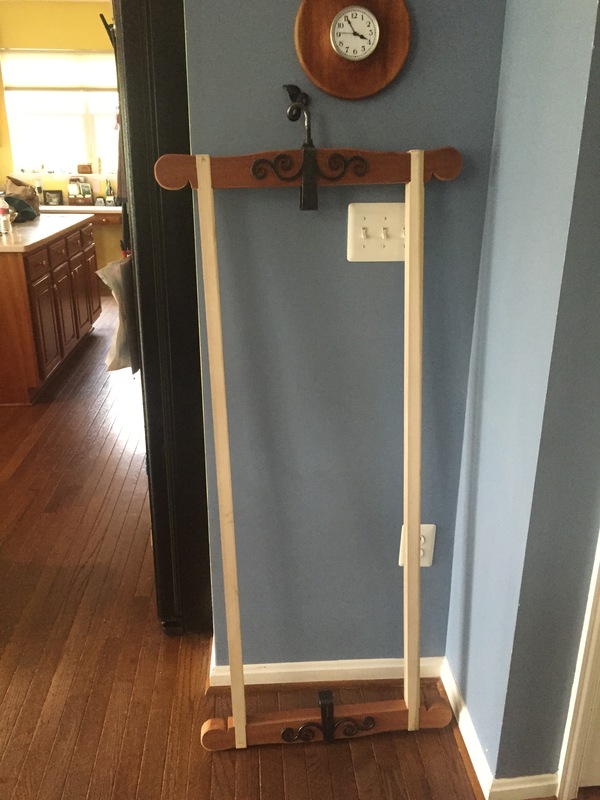 This entry was posted in Shop stuff, Tools and tagged hand tools, made by hand, shop stuff, tool maintenance, Tools on August 31, 2015 by bkbiggs. Completed! the colors are all general finishes premixed milkpaint – Klien Blue, Emerald, Holiday Red, and SunGlow. I wanted the brightest colors I could find. 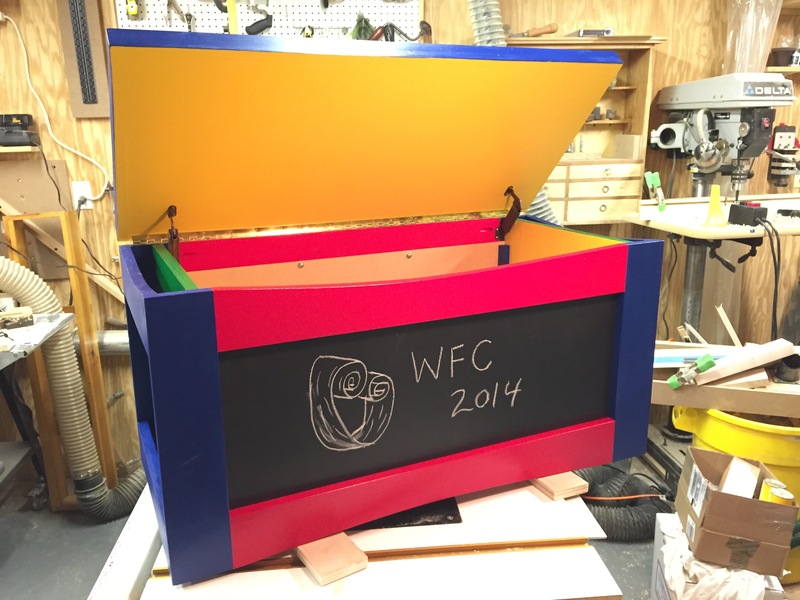 Chalkboards were used front and back, because we have carpeting in the playroom where the toy box will sit, and we’re pretty sure that the markers would find there way to the fiber. 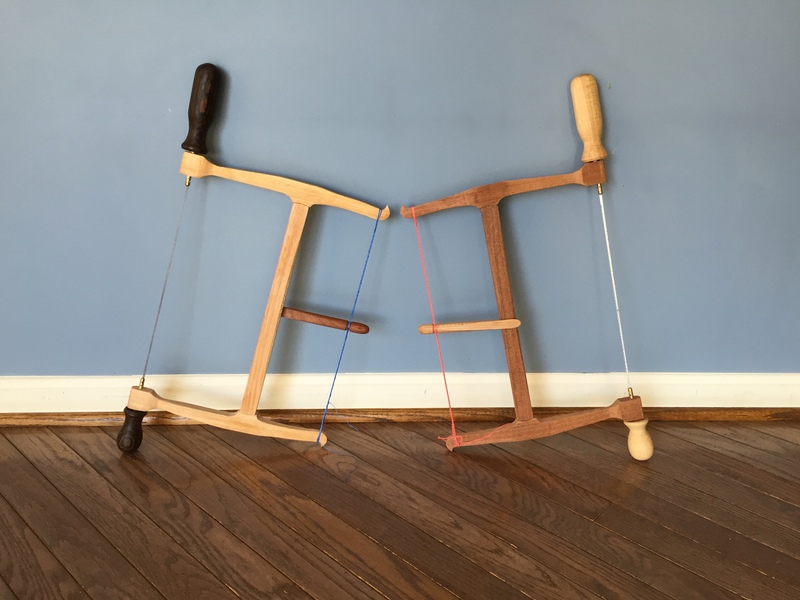 If you want to participate in the build this year and have your build count towards the generous donations from the Spaguonolo’s – you can find out more about it, and the plans, at the WoodWhisperer site. This entry was posted in Projects and tagged Cabinetry, made by hand, power tools on November 23, 2014 by bkbiggs. I have wanted to build the tallow box that Roy Underhill demonstrated in his show. You remember the little box with the dovetail key, and two part lid that slid out and then slid back to release it? The tallow I had was in a little green tin, but it looked out of place in my toolkit. I wanted something that fit in better so I used a small block of cherry sap wood for the box, and a leftover piece of ebony for the key. I resawed the lid (twice) with the top top undercut where it comes together in the closed position. The body cavity was hogged out with a spoon bit (I got it cause I saw Roy use it and loved the flexibility it provides). The tallow came from amazon and turns out just fills the body cavity I made. This entry was posted in Shop stuff and tagged made by hand on October 25, 2014 by bkbiggs. 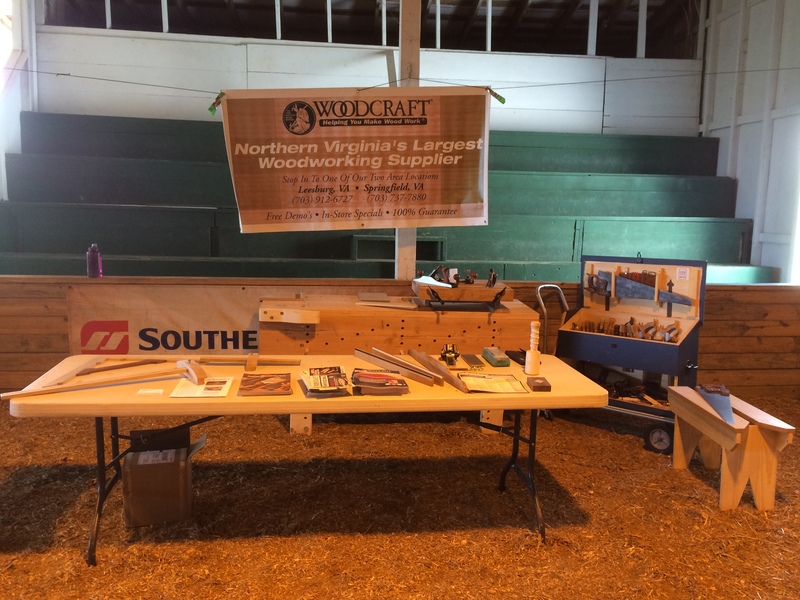 I had the chance to attend the maker fair at the Loudoun County fairgrounds this past weekend, as a representative of Leesburg Woodcraft. I met a bunch of like minded folks (folks that like to build things). My role was to make sure that people in the maker community knew that there was a place they could go, locally, to get hands on with the tools and supplies they need – but more than that, we talked about ways to act more inclusively with makers in general. It was a great opportunity to meet folks, and I think that I’m going to get more out of this, than I can possibly offer in support :). Check out the kickstarter page for more information on what happened, and throw a bit of love their way! I elected to not take any electrical implements, rather I focused on the hand tools. Many of the home-made tools (thanks to the Hand Tool School membership) were on display along with the recently completed knock down nicholson (which had a lot of admirers). And of course my Dutch tool chest was on display as well – that thing has already got a ton of miles on it. … i’m going to have to build the rolling base for it – the extra storage will hold more of the bench appliances, and I want big rubber tires to help roll it over the ground – it seems I use it more outdoors than in shop spaces these days. This entry was posted in Shop stuff, Shows, Supplies and tagged made by hand, shop stuff, Shows on October 6, 2014 by bkbiggs.